Crowds descended on the Hudson River to watch the demolition of the old Tappan Zee Bridge. Spectators on the east side of the bridge watched with excitement. Rana Novini reports. The Tappan Zee Bridge was demolished Tuesday morning, sending a chunk of the old span into the annals of New York history. The bridge's demolition had been set for Saturday but it was postponed due to high winds. Workers used explosive charges to demolish the remains of the old bridge, which spans the Hudson River between Tarrytown in Westchester County and Nyack in Rockland County. 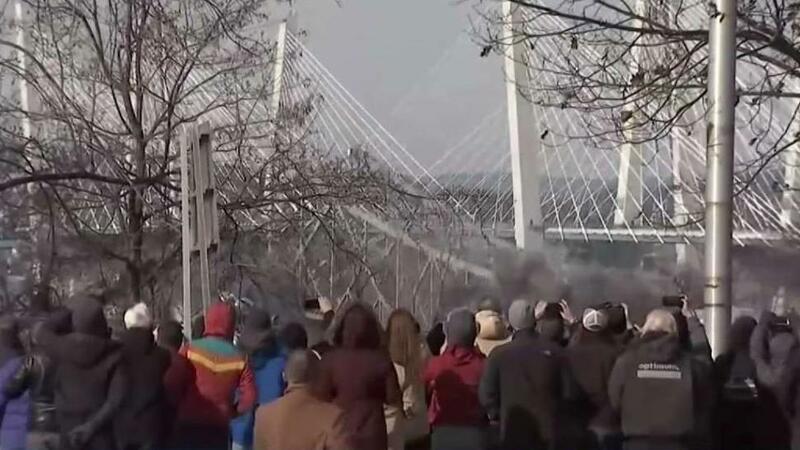 The demolition took place around 10:50 a.m., sending smoke billowing into the air where a portion of the bridge had stood. Traffic was expected to be stopped for about 45 minutes, with crews temporarily closing entrance ramps to the northbound/westbound Thruway at exit 9 (Tarrytown-Sleepy Hollow-Route 9), Route 119 in Elmsford and Saw Mill Parkway (exit 22). Entrance ramps to the southbound/eastbound Thruway were also closed at exit 10 (Nyack-South Nyack-Route 9W) and exit 11 in Nyack (Nyack-South Nyack-US Route 9W). State police were expected to stop traffic in both directions on Interstate 87/287 between exit 11 in Nyack (Nyack - South Nyack – US Route 9W) and exit 9 (Tarrytown – Sleepy Hollow – Route 9) in Tarrytown for approximately 45 minutes. State police will reopen the ramps and release traffic after TZC has determined that the area is safe. Motorists were strongly advised to avoid travel in this area during that time. Those traveling in the area at the time were expected to face severe delays. The new Gov. Mario M. Cuomo Bridge replaced the Tappan Zee. Raw video from traffic cameras shows the exact moment the old Tappan Zee Bridge in New York is demolished. More footage and story details here. The original bridge, which opened in 1955, was a poster child for America's crumbling infrastructure. Shifting steel plates gave drivers unnerving glimpses through road cracks of the chasm below.